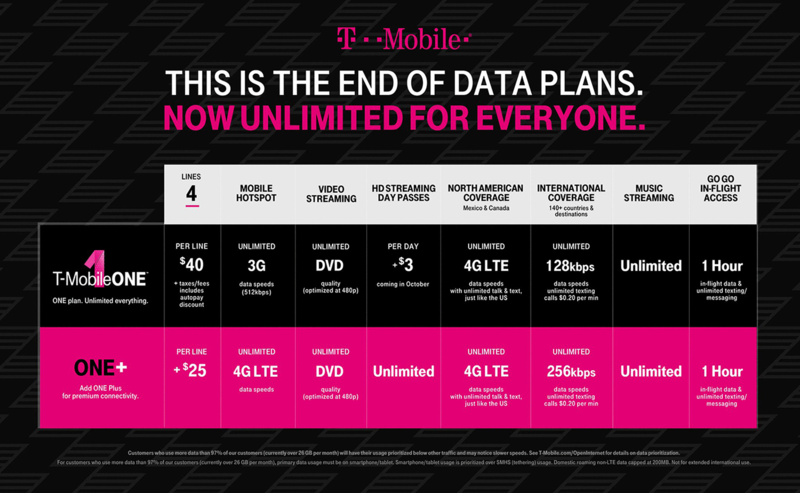 T-Mobile has caught a lot of flak since it announced the new T-Mobile One plan, which it promotes as unlimited. There are a surprising number of limits, though. To counter the criticism, T-Mobile has announced a few changes to One, but some of those changes are simply opportunities to give T-Mobile more money for features you already have. The changes to hotspot speeds will affect the most users. Previously, T-Mobile One would limit hotspot to 128Kbps or slower, which is essentially useless. Now, hotspot will be limited to 512Kbps, which T-Mobile calls "3G." Okay, Tmo. That will at least make it usable for basic browsing, though. T-Mobile is sticking to its guns when it comes to video throttling, but there are some new options here. You'll be able to get $3 HD (unthrottled) video day passes. That's an alternative to paying $25 per month for unlimited HD video. There's also a new add-on called T-Mobile One Plus (hey, that sounds familiar). This $25 add-on includes unlimited LTE hotspot data, 3G speeds (instead of 2G) when traveling abroad, and unlimited HD day passes. Note, you don't always get unlimited HD video—you have to toggle on a day pass, but you can do it as often as you want. With all the add-ons and attempts to placate critics, T-Mobile One is starting to get stupidly complicated. Instead of figuring out data plan sizes, customers are going to be figuring out throttling limits and add-on packs. If you want to avoid all that and make changes to your existing plan, you have even less time. T-Mobile One now launches on September 1st instead of the 6th.